Established in 1634, Boston Common is America’s oldest public park. Puritan colonists purchased the land rights to the Common’s 44 acres from first settler of the area, Anglican minister William Blackstone. The price was 30 pounds, and each homeowner paid him six shillings. The pasture then became known as the Common Land, and was used to graze local livestock until 1830. A town shepherd was paid two shillings and sixpence per head of cowe to tend townspeople’s livestock. 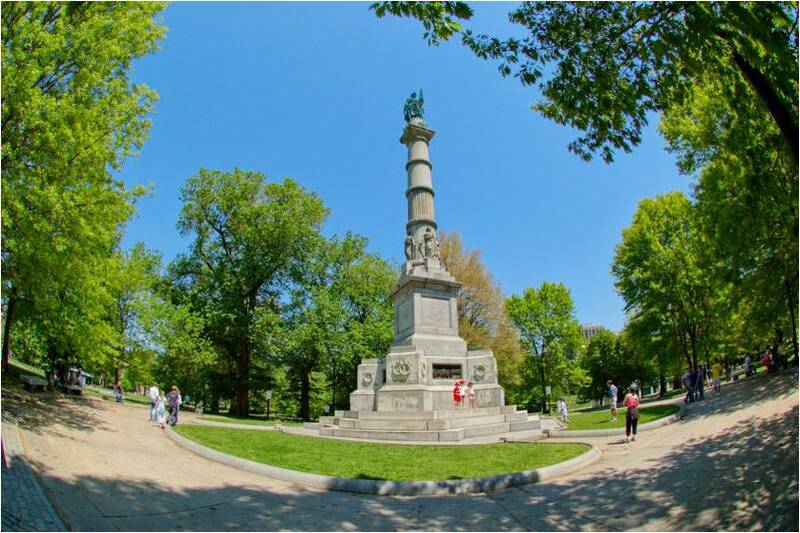 Also referred to as a trayning field, the Boston Common was sometimes crowded with soldiers. Over 1000 Redcoats made camp on the Common during the British occupation of Boston in 1775. It was from the shore of the Charles River, which was then at the southwest corner of the Boston Common, that three brigades of Redcoats embarked on the fateful trip to Lexington and Concord. The Boston Common was a place for celebration as well. Bonfires and fireworks celebrated the repeal of the Stamp Act and the end of the Revolutionary War. Boston Common continues to be a stage for free speech and public assembly. Here, during the 20th century, Charles Lindbergh promoted commercial aviation. Anti-Vietnam War and civil right rallies were held, including one led by Martin Luther King, Jr. In 1979, Pope John Paul II celebrated Mass. Today the Common hosts several citywide festivals and performances throughout the year. It is still open for all to enjoy. 보스톤 코먼은 미국에서 가장 오래된 공원으로 조용하고 평화로워서 많은 사람들이 휴식을 위해 찾는 곳이다. 한가로이 점심을 먹고 낮잠을 즐기기도 하는데 코먼(공유지)이라는 이름에서도 나타나듯이 1634년에 식민지 시민을 위해 매입한 땅으로 소의 방목지로 이용되었습니다. 48에이커의 부지 안에는 혁명의 발단이 된 보스턴 학살기념비와 남북전쟁전사자의 기념비, 센트럴 묘지가 위치해 있습니다. 이쪽에 있는 관광안내소에는 각종 가이드 북과 팜플렛이 배치 되어있고 프리덤 트레일의 출발점이라 교통수단을 이용하기에도 편합니다. 중요한 역사 사적을 둘러보고 나서 조용한 자연에서 한숨 돌리는 것도 좋을 것 같습니다. 단 해가 진 후에는 주의 해야 합니다. 주소: Tremont St. & Beacon St.